As you probably know by now, Belgian outfit Aeroplane is now fronted by just one pilot, with former member Stephen Fasano pressing the "eject" button a few months back. As such everyone has been waiting with bated breath to see what Vito De Luca can come up with. Well, the results are in, and it's an intriguing mix of styles and vocalists, with De Luca showcasing his musicality and studio prowess across 12 very different tracks. 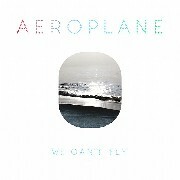 Juno favourite "We Can't Fly" remains a standout, a shimmering, slow-mo Balearic treat, while the Tina Turner-isms of "I Don't Feel" and Depeche Mode flavour on "My Enemy" show a real pop nous. There are some refreshingly subtle moments too, most notably the teasing vocals on "Without Lies". An adventurous debut packed with ideas: we can't wait to see what Aeroplane comes up with next. 07. "The Point Of No Return"
10. "Fish In The Sky"